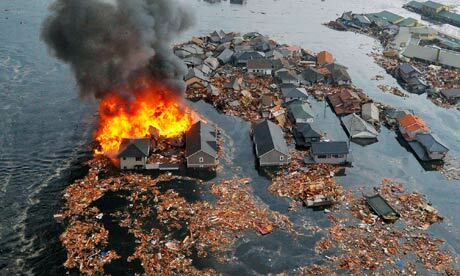 On Friday, March 11, 2011, an earthquake struck off the shore of Northern Japan with a magnitude 8.9. This earthquake created a 23-foot tsunami, devastating the mostly rural area. More than 50 aftershocks have occurred since the main quake, some being over magnitude 6.0. Friday’s earthquake ranked as the fifth largest earthquake since 1900. Hundreds upon thousands of people were left dead, injured, or missing. People in Tokyo and the surrounding metropolis were left stranded because the rail network went offline immediately after the quake. 33 shelters have been set up in city hall, university campuses, and in government offices so far. Evacuations were ordered for those closest to nuclear power plants, requiring people to move at least 2-3 miles away from the plant. Although the plant was not leaking any radiation, it was still hot even after shutdown. The entire Pacific Rim area was put on alert, but the waves were not as strong as expected in the state of Hawaii. At around 9 AM EST, a 7-foot high tsunami hit the island of Maui, while neighboring islands Oahu and Kauai recorded waves at least 3 feet high. Jordan Scott, spokesperson for the California Emergency Management Agency, said that it could take 10 to 12 hours for the effects of the earthquake to completely fade away. Evacuations were made all along the California coast, including 6,000 people near the town of Santa Cruz. Coastal residents continue to stay on watch for any possible emergencies. People are encouraged to make any donations they can to an international relief fund supporting the victims of this disaster such as American Red Cross’s “Japan Earthquake and Pacific Tsunami” disaster relief page on Amazon.com. The Latest News: From the Internet or a Trusted Friend? I have a personal Facebook account, I have thousands of friends, but they are not my source of information about the world. As they are my friends, I try not to make myself susceptible to the phenomenon prevalent in urban legends known as “Friend of a Friend” (FOAF). It is not my friends’ fault by any means when information they pass on through their notes or Status Update cannot be substantiated or independently confirmed. Rather, the information they pass could be, at best, incomplete or, at worst, inaccurate. When an event takes place that may interest the world (e.g., the death of Michael Jackson), for my peace of mind, I go to Associated Press, Reuters, and UPI in order acquire a “best average” of the news coverage. On the other hand, when information I receive fits the structure of an urban legend, I immediately go to Snopes to confirm or debunk the information. I’d rather turn to news sources to find out for myself what to know, and turn to my friends to discuss what they think. Do you immediately take information from your friends at face value or do you verify what you hear?